We've had a number of questions regarding the growth and the risks surrounding China's Wealth Management Products (WMPs). Here is an overview in a Q&A format.Q: What are the reasons for the continuing demand and proliferation of WMPs in China?1. 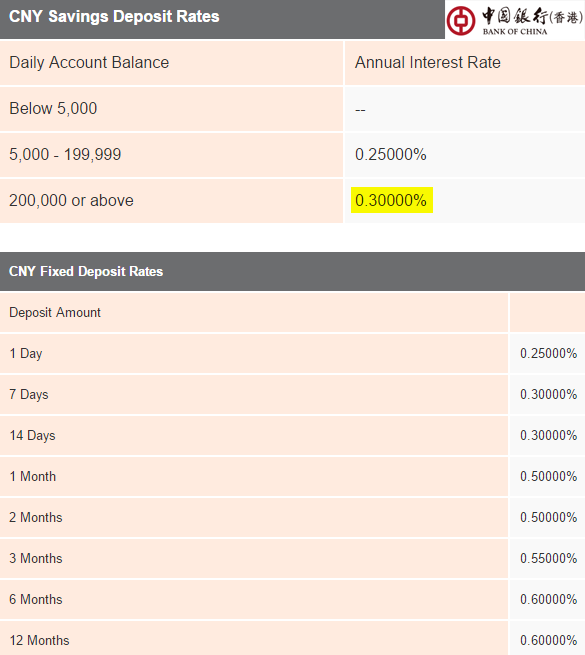 China's bank deposit rates have been extremely low over the past decade and until recently have been artificially capped by the nation's central bank, the PBoC. The reason for these low rates is Beijing's effort to make sure that the banking system has access to cheap financing in order to stimulate credit growth. Source: Tradingeconomics, PBoC These days, awash with deposits, many banks pay even less than the latest rate set by the PBoC. Here is one example showing why China's depositors have been desperate for yield. Source: Bank of China (one of the 5 biggest state-owned commercial banks in China) 2. Another reason for the explosion in WMPs in China is the rapid growth in money supply, with limited options to deploy all the new cash. 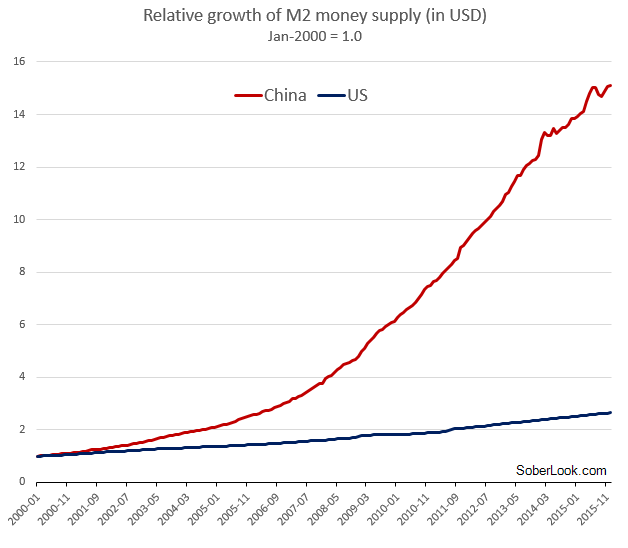 The chart below shows China's broad money supply (M2), now 15 times the size it was at the end of 1999. That's a great deal of liquidity sloshing around. 3. More money poured into WMOs last year after the massive "correction" in China's stock market, as investors looked for other sources of yield. Q. What rates do banks offer to their WMP customers? A. We've had a number of questions regarding the growth and the risks surrounding China's Wealth Management Products (WMPs). Here is an overview in a Q&A format. Q: What are the reasons for the continuing demand and proliferation of WMPs in China? 1. 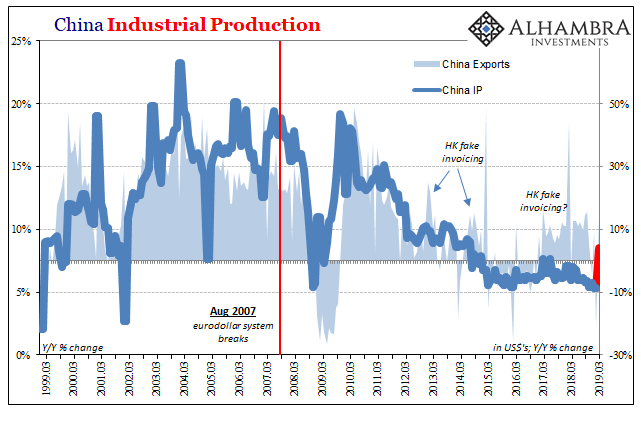 China's bank deposit rates have been extremely low over the past decade and until recently have been artificially capped by the nation's central bank, the PBoC. The reason for these low rates is Beijing's effort to make sure that the banking system has access to cheap financing in order to stimulate credit growth. These days, awash with deposits, many banks pay even less than the latest rate set by the PBoC. Here is one example showing why China's depositors have been desperate for yield. 2. 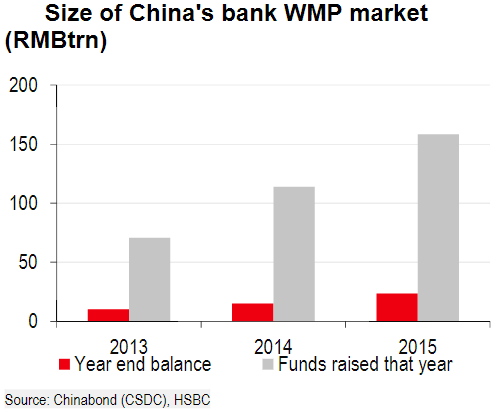 Another reason for the explosion in WMPs in China is the rapid growth in money supply, with limited options to deploy all the new cash. The chart below shows China's broad money supply (M2), now 15 times the size it was at the end of 1999. 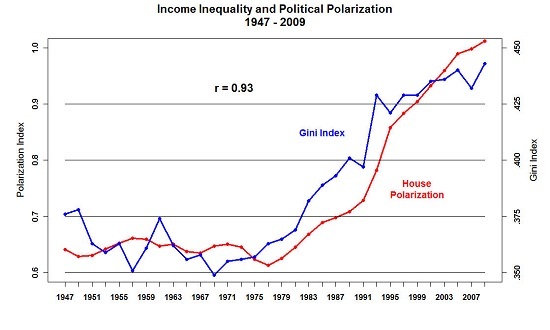 That's a great deal of liquidity sloshing around. 3. More money poured into WMOs last year after the massive "correction" in China's stock market, as investors looked for other sources of yield. Q. What rates do banks offer to their WMP customers? A. In 2015 the typical WMP product yield ranged between 4.5% and 5%. Q. What is the typical WMP term? A. 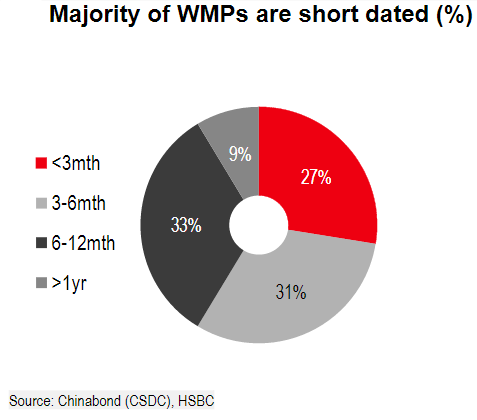 According to HSBC, "more than 90% of China’s fixed duration WMPs are shorter than a year". Q. How do WMPs generate returns? A. These days most are invested in corporate bonds although some also invest in private loans. The most popular type of bond in WMPs' asset portfolios is a AA corporate (domestic agency ratings of course) with a 4-5 year maturity. Q. What is the yield on such bonds currently and is it sufficient to pay the WMP rates? A. 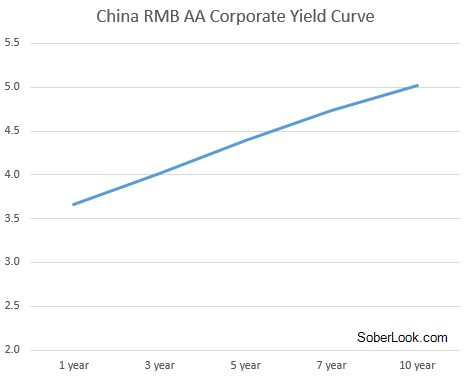 Here is the RMB AA corporate yield curve. With a little help from leverage (usually via the repo market) and/or a big duration mismatch, WMPs generate the necessary yield. Q. Has the WMP growth impacted corporate bond yields in China? A. Yes. 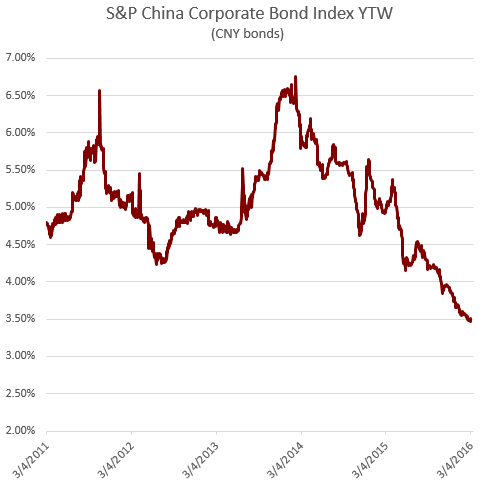 Since early 2014, China's corporate bond yields have been steadily declining. A great deal of this is the result of China's WMP demand. A. While banks actively market these products, these days the management is outsourced to brokers (and other non-bank entities) with asset management/trading desks. Banks used to manage WMPs but due to regulatory and resource constraints have shifted the process to third parties. Q. What sort of arrangements do banks have with WMP managers? A. WMP managers operate like hedge funds, retaining 20-30% of the upside above the "guaranteed" contractual return of 4.5% - 5% (this is on top of the management fees). Q. What type of risks are inherent in this market? A. 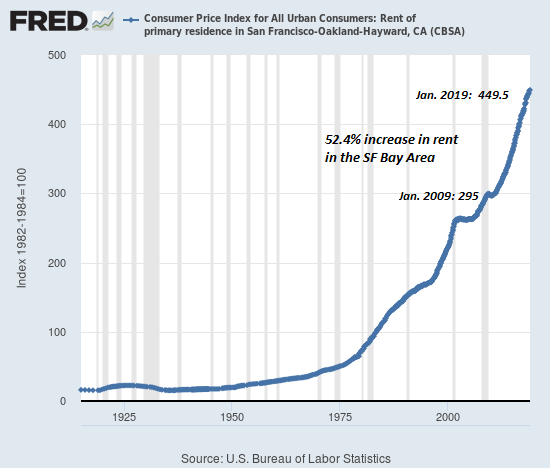 Given the hedge-fund style upside, this can be an extremely profitable business, encouraging higher leverage as rates decline. Since this activity is concentrated outside of the banking system, it is not yet regulated, resulting in rapid growth in China's "shadow banking". In fact this is one of the key reasons the PBoC has been so reluctant to lower the target interest rate, focusing on the reserve ratio (RRR) instead. Lower rates will encourage further "reach for yield" and increase leverage in the system. An even greater systemic risk in the WMP market is the asset-liability mismatch - one of the key problems that precipitated the financial crisis in the United States (funding illiquid mortgage bonds with asset-backed commercial paper or repo). The chart below shows the amount of WMP placed vs. what is actually reported at year-end by banks. Many WMPs are timed to mature before the bank reporting date ("window dressing"). Most WMPs of course mature several times a year and the industry relies on the WMP customers to roll (on a net basis) their maturing WMPs. 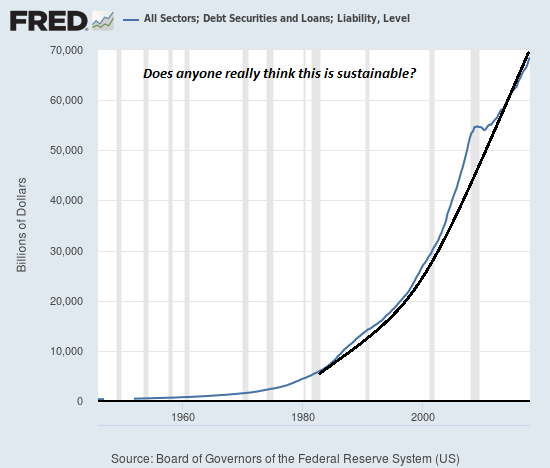 Moreover the market's tremendous growth has banks and managers believing that rolling would not be an issue. If some investors pull their money out, there will always be plenty of new ones wanting to come in. Sounds familiar? Q. 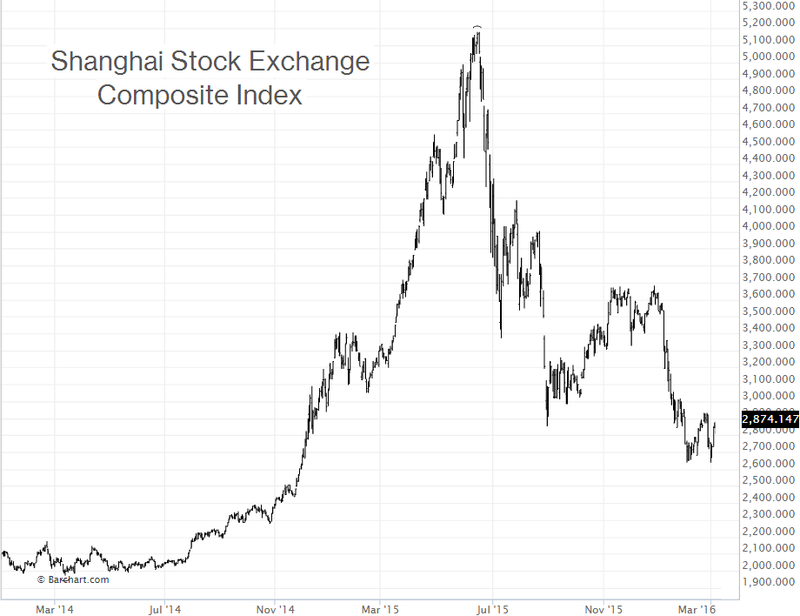 Why isn't Beijing addressing this rising systemic risk? A. The PBoC has to tread carefully in order to avoid disrupting its growing domestic bond markets. The situation is quite fragile and any hint of a serious regulation could send the corporate and other bond markets tumbling (starting a deleveraging cycle). As the regulators try to figure out how to contain these risks (including endless discussions with the major banks), the WMP market continues to grow.